方: 王先生,您在看什麼? Mr. Wang, What are you doing now? 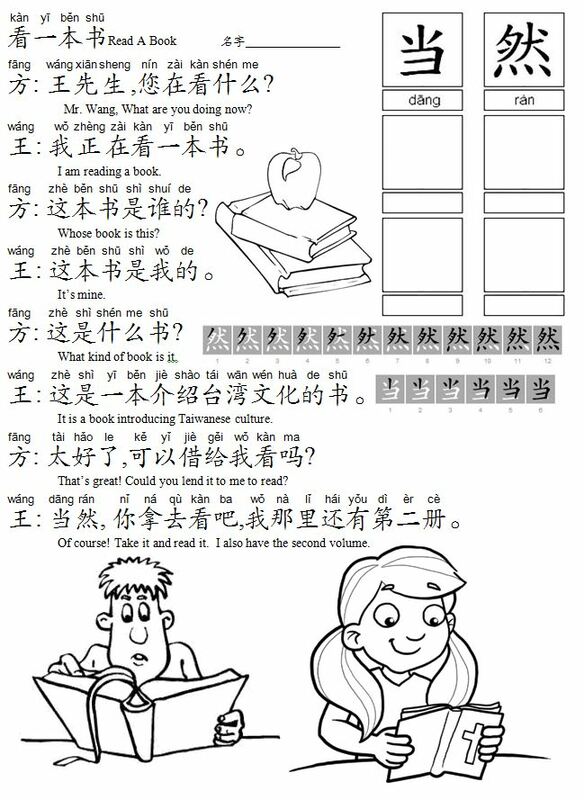 王: 我正在看一本書。I am reading a book. 方: 這本書是誰的? Whose book is this? 方: 這是什麼書? What kind of book is it. 王: 這是一本介紹台灣文化的書。It is a book introducing Taiwanese culture. 方: 太好了,可以借給我看嗎? That’s great! Could you lend it to me to read? 王: 當然, 你拿去看吧,我那裡還有第二冊。Of course! Take it and read it. I also have the second volume.